At their meeting next week, the UBC Board of Governors will be publicly discussing the university’s plan to increase winter session residence rents by 20%. In a demonstration of its commitment to transparency and accountability, the Board actually already met among themselves to talk about the rent increases this week, but did so behind closed doors. The real discussion and decision-making having taken place already, the Board has invited students (the AMS and RHA) to the meeting next week for some “accountability theatre”. In the lead-up to the board meeting, we’ll be publishing some old and new content about the student housing model used by UBC. Yesterday’s post outlined how, to build housing, UBC Student Housing and Hospitality Services (SHHS) must borrow money from UBC. The university, from whom the money is borrowed, charges profit-seeking interest rates on those loans of 5.75% or more. Today I will present a case study of where that interest revenue goes. UBC wants to build new undergrad teaching labs for students in courses offered by the departments of Biology, Botany, Zoology, Microbiology & Immunology, Biochemistry & Molecular Biology, and Cellular and Physiological Sciences. 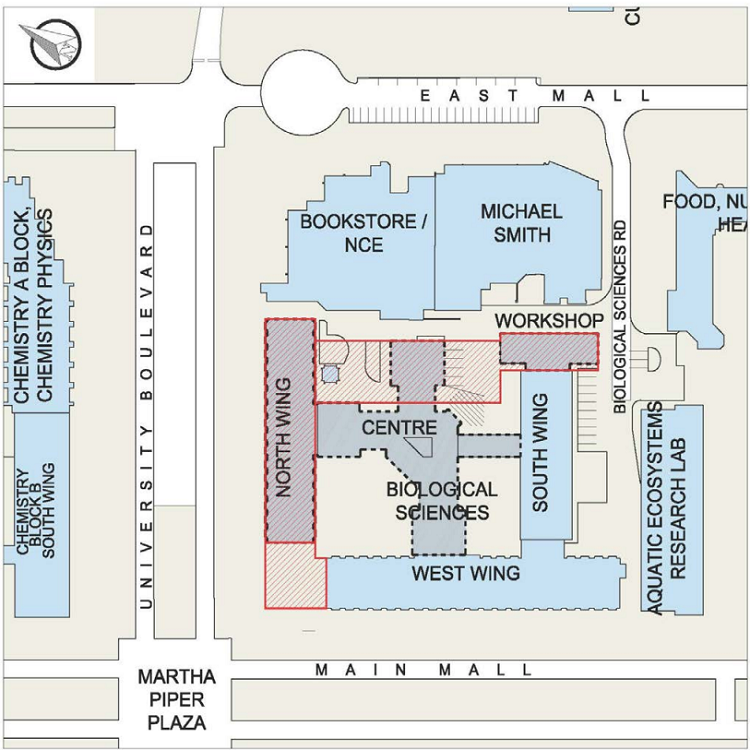 These new labs would be located in the Biosciences building with major renovations to the North wing and replacement of parts of the Centre and South wings, shown below. The red hashed areas outline where renovations/additions would be for upgraded undergrad teaching labs at the Bioscience building. The undergrad teaching labs project is estimated to cost $80M. As is the case with many campus building projects, UBC does not have $80M. So, UBC has concocted a plan to come up with $80M. Part of it is difficult to comprehend. Please bear with me; I will try my best to explain. The first two portions of the funding are relatively easy to explain. In the first bullet, the provincial government gives UBC $21.25M. In the second bullet, UBC takes $21.25 out of its ~$1.2B endowment, with a promise to pay it back. In essence, UBC is loaning money to itself. UBC Central commits to paying back the full amount, with interest (5.75%), from its annual operating budget over the course of 30 years. In the third bullet, UBC takes $37.5M out of its endowment, with a promise to pay it back. Again, UBC is loaning money to itself. But rather than paying back that loan from the annual operating budget, it will be paid back [with interest (5.75%) over 35 years] from the investment income generated by the endowment. This is where things get weird because the endowment is both the source of the loan, and the source of repayments for the loan. It may not make sense initially, but laying out the step by step details of the undergrad teaching labs financing plan may help to clarify things. Step 1: UBC takes $37.5M out of its endowment to build new teaching labs. There is a promise to pay it back, with interest (5.75%), over 35 years. Step 2: Meanwhile, UBC leases land in the Wesbrook Place neighbourhood to private housing developers. The amount of land being leased is enough to build approximately 300,000 sq. ft. of market housing and is expected to generate $57M of income. Step 3: UBC puts that $57M into the university’s endowment. Step 4: SHHS is then given a $57M loan from the endowment to build new student residence(s). Step 5: SHHS pays back that loan over a period of 35 years at an interest rate of 5.75%. Loan repayments ultimately come from the rents charged to students to live in residence. Step 6: UBC takes a portion of the interest revenue from SHHS loan repayments and uses it to pay back the $37.5M loan for the teaching labs. As you can see, there is some complicated financial wizardry afoot. UBC is acting both as the lender and the borrower for two different loans. Below is how it was illustrated for the Board of Governors, taken directly from their documents. This illustration is not particularly helpful in any way – I’m just including it to show how inscrutable this financing plan can be. Carefully following the plan shows that the $57M from the land lease does not provide the funds which are used to build the teaching labs. Instead, it acts as capital for the loan to build residence(s). SHHS must ultimately pay back the entire principal of the loan, plus inflationary increases to the principal, plus interest. By the end of the process, the $57M has been returned to the endowment and is essentially unspent. Instead, the funds that are spent, which go towards paying for the teaching labs project, are generated from the interest on the loan to SHHS. Inflated student rents pay for that. In other words, the ultimate source of the funds for the bulk ($37.5M) of the project’s cost is students living in residence.